While standard transceivers offer the perfect fit for data handling and transfer within the data center or over shorter distances, problems arise when 100G traffic needs to be transported over long distances. Similar challenges emerge when more than one single channel is required or when multiple traffic types need to be connected over the same dark fiber link. 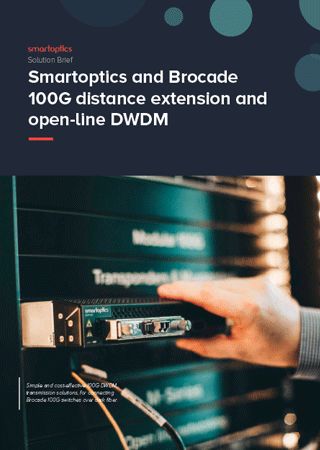 The Solution Brief show how the challenges can be overcome with distance extension and open-line DWDM solutions from Smartoptics, verified with Brocade’s 100G switch families for simple, cost-effective data center connectivity over dark fiber.